Rovio Entertainment announced that Fergal Reilly and Clay Kaytis will direct “Angry Birds,” the upcoming 3D CG-animated film based on Rovio’s bestselling app. The film is being produced by John Cohen and Catherine Winder and executive produced by David Maisel; the screenplay is by Jon Vitti. The movie is slated for a July 1, 2016, release and will be distributed worldwide by Sony Pictures. Angry Birds is one of the world’s biggest entertainment franchises, starting in 2009 with the original mobile game that remains the No. 1 paid app of all time. 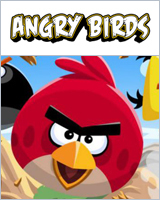 Angry Birds has expanded rapidly into entertainment, publishing, and licensing to become a beloved international brand.